It doesn’t matter what line of work you’re in, you need a creative environment to be at your best. From the colors that surround you to the intangible feeling of cohesiveness, business owners, employees (both remote and on-site), and even visiting clients should have a place that facilitates innovation, collaboration, and comfort. Below we highlight eight of the smartest aesthetic choices that help boost creativity and innovation in the workplace. Colors have a significant impact on productivity, creativity, and innovation. The right splash of color can have some significant implications when it comes to productivity levels. Blue, Green, Yellow, and Red have all been shown to increase and improve workflow. However, each color has its own benefits. According to a report by Entrepreneur, blue is best for building a stable and calming environment that helps people stay focused. Also on the cooler side of the color wheel is green, which is superb for working long hours and burning the midnight oil. This is partially due to fact that it doesn’t cause eye fatigue the way other colors do. Over on the warmer side is yellow. This sunny color is known to promote optimism and stimulate creativity. Lastly, red is great for tasks that involve physical labor as it raises heart rate, increases blood flow, and evokes emotion. On the flipside, yellow and red are also known to make you hungry, hence the following suggestion. What snack packs the most punch you ask? Scientists have dubbed blueberries, “brainberries” after discovering their phytochemical power. After studying nutritional modulation of cognitive decline, neuroscientist James Joseph has discovered that these tiny, dark-hued fruits actually intervene with our brains at the molecular level, helping our minds to be maximally responsive to incoming messages and even prompting the growth of new nerve cells. If you can’t get your mitts on some berries, settle for one of the cheapest fruits in the bunch: a banana. This lean source of manganese, potassium, and carbohydrates will give you the nutrients you need to stay sharp. Start your day off with one of these phallic fruits and you’ll stay satiated until lunch time. Research by Psychology Today suggests that a little red wine may keep you in work mode longer due to its heavy dose of antioxidants (concord grape juice has the highest total antioxidant level of any fruit or vegetable), which help improve motor skills and short-term memory. However, alcohol also has a knack for slowing down the brain’s ability to function. That being said, perhaps you should swap out the wine for grape juice and leave the alcohol for happy hour. If there is a way to cut down on the amount of 90-degree angles in your office or workspace, take it. Research by Oshin Vartanian, found that people are more likely to see spaces as beautiful if they’re curvilinear rather than rectilinear. Curved edges are universally more aesthetically pleasing than right angles. When assessing aesthetics, curves activated the anterior cingulate cortex exclusively. This region of the brain is extremely influential, and to a high degree is responsible for linking behavioral outcomes to motivation, positive emotional responses, and emotional salience to objects and shapes. Late geologist and poet, Jay Appelton, would even argue through his “habitat theory” that the feelings about—and the benefits of working in—a natural-looking environment are profound because they align with primal reactions. These innate responses evolved from perceiving environments as either favorable or unfavorable to survival. The level of observed beauty in a particular area then is filtered through both today’s standards of aesthetics and an intrinsic, prehistoric lens. Because curved and rounded edges have a way of putting the subconscious mind at ease through signaling safety, it opens up cognitive space for creativity. Arcs, cylindrical patterns, and smooth transitions through the workspace can spark conversation, allow for more organic movement, and foster a stronger sense of community. Psychologist Robert Epstein, PHD argues that there is no “evidence that one person is inherently more creative than another.” He asserts that creativity is actually something you can cultivate. “Regular dinners with diverse and interesting friends and a work space festooned with out-of-the-ordinary objects will help you develop more original ideas,” Epstein continues. If you’re trying to let your business flourish, you need to let in some light. Open the blinds and make sure your employees can get some sun. Studies have shown that natural light has mood boosting effects which can parlay into a more creative mindset. In fact, getting sun is so important that studies by the Northwestern University of Chicago, reported that there is a strong relationship between workplace daylight exposure and office workers' sleep, activity, and quality of life. "Day-shift office workers' quality of life and sleep may be improved via emphasis on light exposure and lighting levels in current offices as well as in the design of future offices," says researcher Ivy N. Cheung. Workers who received natural light from a window slept an average of 46 minutes more per night than their sunless counterparts. Moreover, quality of life and health scores showed that that lack of light affected people’s circadian rhythms, which in turn increased their chances of obesity, diabetes, depression, bipolar disorder, and seasonal affective disorder. As some of you already know, windows aren’t always possible. In that case, add a desk lamp to your area to cut back on the use of fluorescent lighting. If the winter months or the lack of sunshine has got your down, you can also try a “happy light,” or light therapy box. According to the Mayo Clinic, light therapy can be an effective treatment for seasonal affective disorder, or SAD. Modern design trends are leaning heavily on the open office layout. While this contemporary work environment has some great benefits (i.e. cheaper, easier to expand, aesthetically pleasing, more options to create better feng shui) it comes with a major pitfall: background noise. Background noise is serious creativity killer. For that reason, it’s best to create an open area of the office for collaboration and the exchanging of ideas (such as a café or a break room) and then an additional area for privacy, concentration, and head-down productivity. Many coworking spaces strike a balance between cubicle-free open office areas (good for collaborating), break room/café style areas (great for sharing ideas and connecting with people), and private call rooms (excellent for reducing noise in “work zones” and buckling down without distractions). Although background noise can set back productivity, the conversations that occur in many coworking spaces are at the heart of networking. People are connecting with others who they would have been unlikely to have met in a traditional work setting. 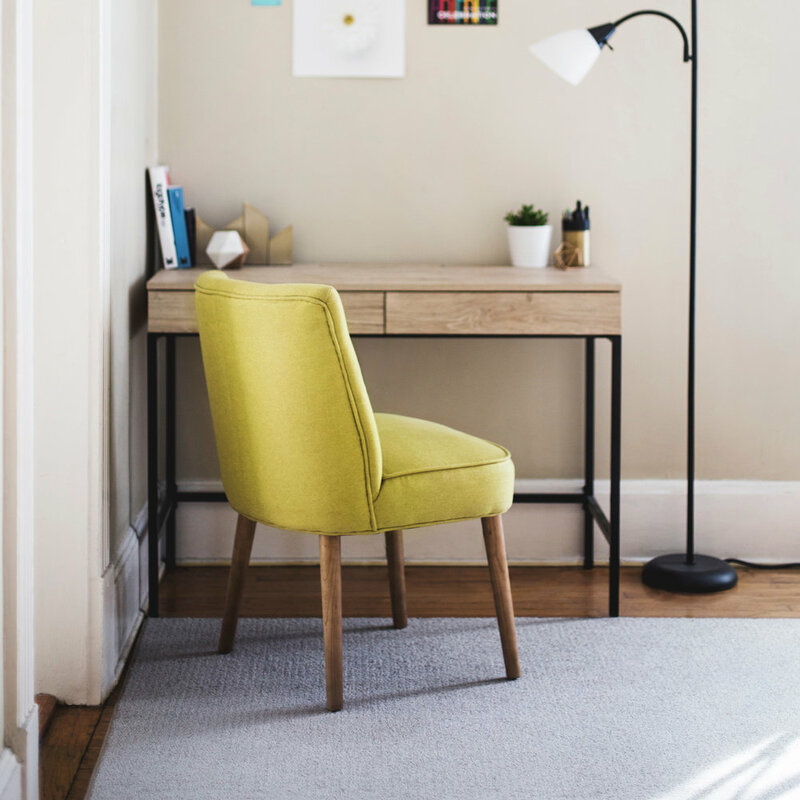 Whether you’re designing an entire office or only have a desk to decorate, add some personal touches to your space. Think about bringing in photographs, souvenirs, artwork, etc. 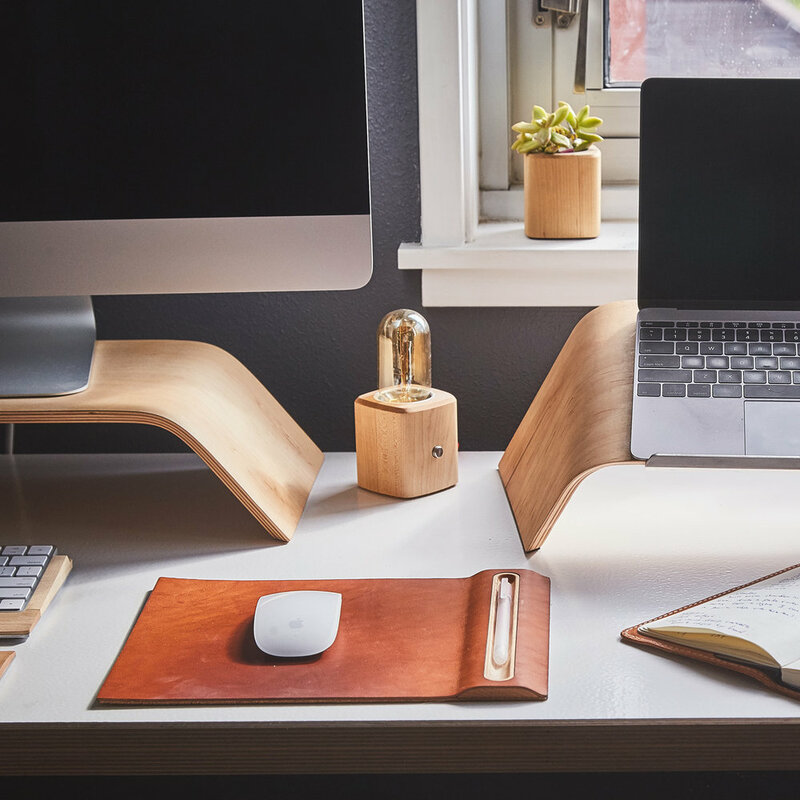 While it’s often beneficial to have a separation between work and personal life, it can be helpful to add some elements of home to your desk or office. Yes, printed inspirational quotes can, at times, be cringe-worthy. However, it does add vigor to some people’s motivation. As long as you’re not distracting your colleagues with your decorations, and they make you feel good, then go with it. Arguably one of the best customizations anyone can make to their desk is to simply raise their monitor to eye level. If you’re using a laptop, spring for a second monitor. Not only does a dual screen workstation look badass, but it also boosts productivity and reduces neck strain. Also, if you’re using a hard plastic or wooden chair, think about exchanging it for a more ergonomic seat. We’ve heard awesome reviews about the Knoll Generation Chair, the Herman Miller Sayl Chair, and the Herman Miller Aeron Chair—although they’re definitely pricey, a comfortable chair is worth the investment. Remove clutter from your desk to boost your creativity and productivity. Organization not only increases workflow, but it can also look awesome. If you’re a tactile kind of person who likes to print things out, build yourself a system that reduces clutter. Think about using color coded filing systems, task cards, check sheets, and to-do lists. Systems such as these will keep your area clean and clutter-free. By color coding your system, you can make faster and better decisions about where to file important papers right when you receive them. At the end of the day, the last task on your to-do list should always be to clean your area for the following morning. Rid yourself of extraneous items, crumbs, smudges, dirty mugs, and anything else that is unsightly or distracting. What is your brand about? Are you trying to be high-end? Playful? Trustworthy? Tech-Heavy? Aim to make your furnishings comfortable and on-brand. Not only does a nicely-appointed office make for great social media posts, it also engenders a sense of cohesion and community, and visiting clients will get a better sense of what you’re all about. If you’re still lacking that identity your craving, find a company that specializes in developing brands to help your business flourish. If you’re interested in elevating your brand, contact Ethos Copywriting today by clicking the button below. Have a comment, suggestion, or something to add? Drop us a line below.